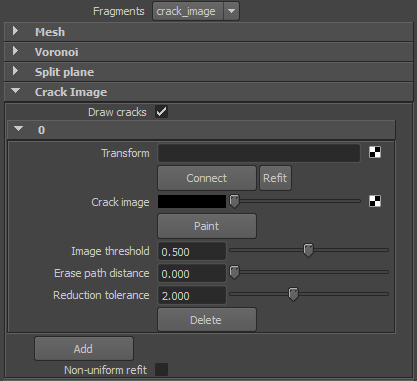 The Crack image feature of Fracture allows a user to interactively paint, or assign an image, to define the fracture pattern that is projected through a mesh. 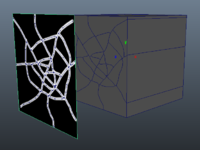 This feature is commonly used in creating spider-web fracture pattern for shattering glass. Draw the extrapolated splines on the crack plane. Like with the split plane feature, a user can create more than one plane with which to project a crack image through. 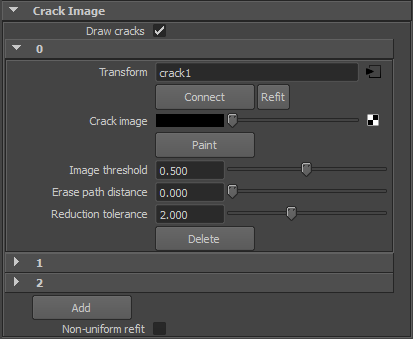 By default there is a single crack node available. More can be added and are indexed starting at 0. Each crack plane index has its own instance of attributes, covered below, to allow for individual adjustment of attributes on a per plane basis. The Attribute Editor example below shows that the current node has 3 crack image planes. The first one (0) is expanded to illustrate the available attributes for each crack image plane. When connected, each of these nodes can be found in the Outliner. By default the naming convention is "crack#". Name of the sketchPlane node assigned to the current index. When a new index is added it does not yet have a crack node (sketchPlane) assigned. Clicking the Connect button will generate the node. If, at any time, the source geometry is scaled the Refit button will scale to the largest bounding box axis. Attribute that the input image will be connected to. On a new crack image node there won't yet be in image connect. Clicking the Paint button will immediately put in you into paint mode. 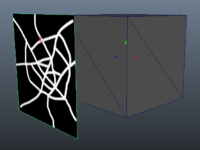 This artisan mode will allow a user to paint (in black&white) on the plane node to define the fracture pattern that will be projected through the mesh. If the current scene is new and has not yet been saved you will see this dialog box. As the pixel value attribute is dialed down the lower values on the image are used. Erase paths shorter than this distance in pixels. When toggled on this option allows a sketchPlane to scale non-uniformly to the bounding box when the Refit button is pressed. There are handful of buttons that are located within the crack image attribute group. 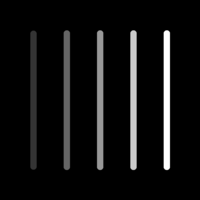 Create, and connect, a sketchPlane node that will be used to paint on before projecting the cracks onto the mesh. Based on whether or not the Non-uniform refit option is set to; scales a sketchPlane up to match either the largest dimension of the objects bounding box or the XY bounding box. Initiates Maya Artisan mode to allow a user to paint on the sketchPlane node. Deletes the current crack image and its associated sketchPlane node. Creates a new crack image group. The sketchPlane node is not connected until the Connect button is used. This page was last modified on 12 July 2012, at 04:33. This page has been accessed 19,725 times.